The cover of this recent offering from Rainfall Books didn’t lure me. While perfectly appropriate for the novel’s setting, and fair play for spurning cliché, it seemed rather bland. But within a couple of pages, I’d immediately warmed to Mark West’s literary world. 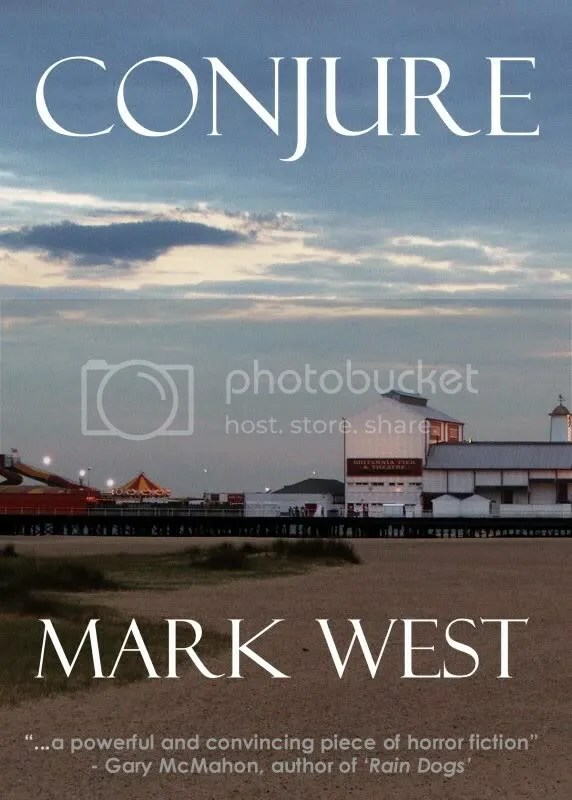 Conjure features Beth Hammond and her boyfriend Rob, a newly pregnant and cash-strapped couple from London who win a short break in the cheap, British seaside resort of Heyton. We meet Beth on her way home through the bustle of a London rush hour, and discover that she has a gift. She can see dead people. The other characters are gradually introduced, their reassuringly average lives drizzled into the mix, which makes a pleasant change from books that bellow from the first paragraph, terrified that you might lose interest. But Mark has the cool confidence of a storyteller who doesn’t have to resort to tricks to snare a reader. Once Beth and Rob travel to the coast, we soon learn that there is more to Heyton than the pier, the rides and the fish and chips. The town has a chilling history that quite literally won’t stay buried. Despite the initial lack of action, Conjure fosters suspense from the outset and nudges it up as the novel progresses. The back story of the malevolent spirit – a wronged and murdered woman – who threatens our pregnant protagonist is presented in neat, almost teasing little doses, often in the form of visions that come alive from the page. Mark excels at dialogue and characterisation – real people we come to know – and these unconnected folk slowly merge, at first barely brushing past each other in the plot until they are entwined. The setting is perfect, and reminded me of several faded resorts: old fashioned and hard-up, but soldiering on with a stiff but weary upper lip. I particularly enjoyed the gothic cinema. It’s a wonderful place that I would love to visit, and now actually feel as though I have. Mark also has the knack of making relatively trivial things seem important – the way they are in real life – such as when a man driving a JCB accidentally damages an iconic war memorial in the centre of town. By making us care about lesser troubles, the moments of brutal horror that lurk around the corner have infinitely more impact. Conjure flaunts some genuinely spooky moments. A scene in which Beth is trapped inside a toilet cubicle made me writhe and I could barely wait for her chance to escape. When a spontaneous holiday snapshot captures the ghost on film, it was descibed in such a way that it raised goose-pimples down my arms. The ghost uses mind control and amnesia, and the confusion of its unfortunate puppet – a tough, local family man – is expertly portrayed. It becomes difficult for the reader to judge the perpetrator, despite the depths of his crime. Overall, the supernatural element works so well because the author merges it with fears we understand such as abduction and infanticide. This is a strong short novel written in sharp prose. The plot is somewhat generic, but it is well executed and avoids cheap twists. The tale builds up to a finale that manages to feel classic yet original at the same time and concludes with a tasty uppercut, just in case you’d forgotten who was in charge. At only 140 pages, it’s possible to finish in one sitting, which is a good job. Just one more chapter, then it’s time to get some sleep, I kept saying to myself as the night advanced. But Conjure had other ideas.